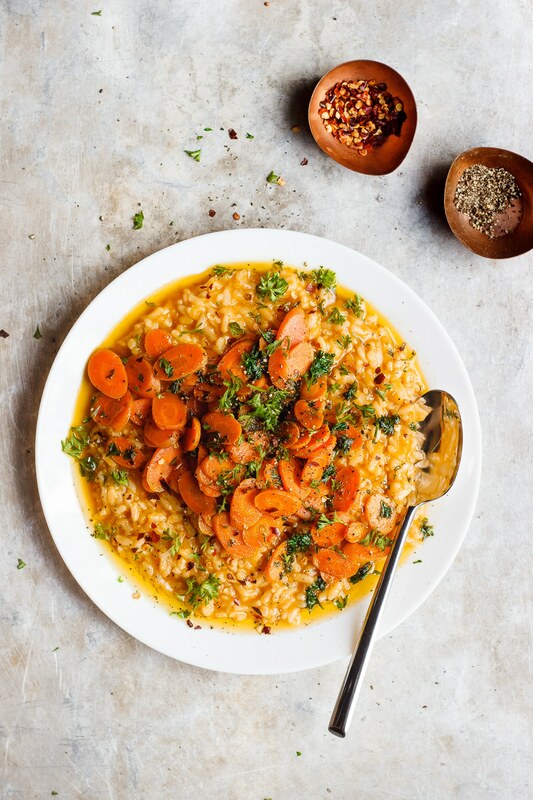 Cozy no-stir risotto with herbed caramelized carrots. 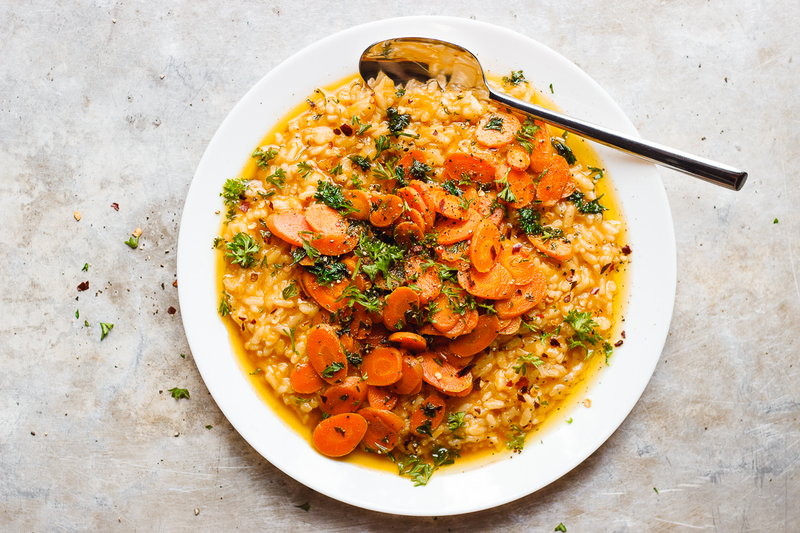 A naturally gluten-free and vegan risotto recipe. Quick, easy, stir-free risotto. 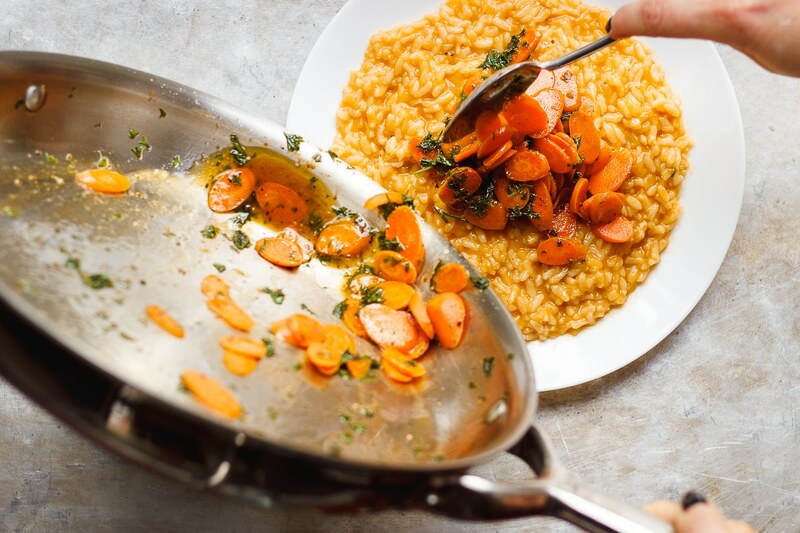 A vegan, no-stir risotto with herbed caramelized carrots. I don’t like having more than I need. And I don’t like to own things that I don’t use. Throwing things away gives me life. There isn’t a better sound than my computer’s trash emptying. Marie Kondo is my savior. For better or worse, I have always been this way. I wasn’t exactly looking for another kitchen. So when All-Clad approached me about their new Prep & Cook, I was apprehensive. But I have to admit this piece of equipment is pretty amazing. 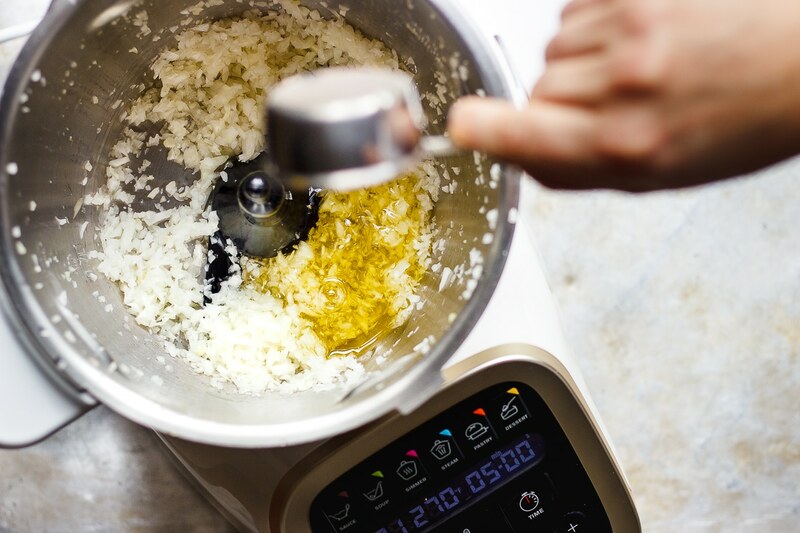 It’s equal parts slow-cooker, steamer, stock pot, food processor and blender. It cooks, steams, simmers, stirs, chops, kneads, whips, crushes and more. It’s kind of genius actually. It has six preset modes plus manual settings for greater control. I was taught how to make risotto by my in-laws during my first trip to Italy. So while the idea of a no-stir risotto is not a traditional risotto it is still quite delicious. In short, the end result tastes the same and largely because the Prep & Cook and has a stir function. So it’s technically not a no-stir risotto since the machine is stirring for you. But this lends to hand-free stirring, and more time to do other things like sautéing herbed caramelized carrots. You can use the basic no-stir risotto recipe and top it was so many things. Here I’ve quickly sautéed thinly sliced carrots and herbs with white wine. But you could top it with fennel and white beans or lentil mushroom bolognese sauce or balsamic roasted beets or other seasonal vegetables. The possibilities are endless y’all. The next thing I’ll make in my All-Clad Prep & Cook is soup. 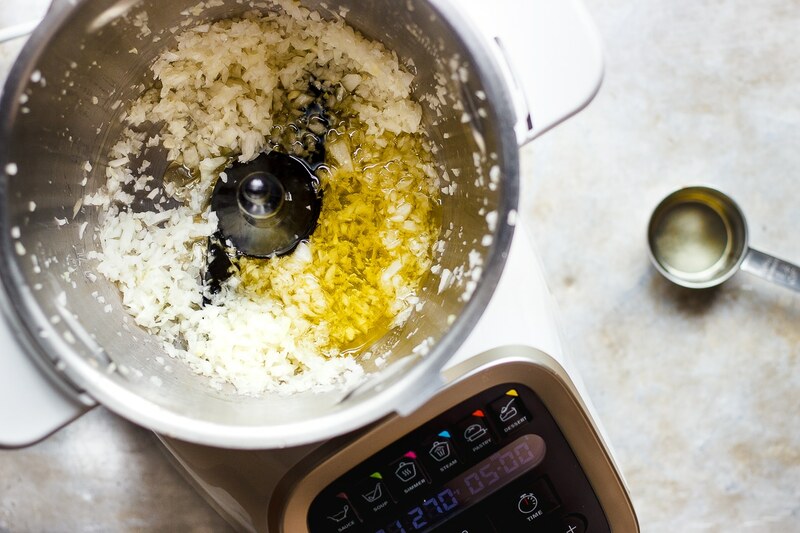 Because chopping, simmering and pureeing all in one device sounds like pure heaven. My friend Phoebe’s golden beet soup is first on the list. The color of your risotto will depend largely on the color of your vegetable broth. My broth was fairly dark brown, so it resulted in this orange-y color. Which I actually love. Below are directions for both the All-Clad Prep & Cook and stovetop directions. This no-stir risotto is naturally vegan and gluten-free. Adding in the cheese is very optional and adds an extra layer of creaminess. I like it both with and without. Roughly chop the onion and place it in the All-Clad Prep & Cook bowl with the ultra blade. Mix at speed 11 for 10 seconds. Scrape down the sides of the bowl, and replace the ultrablade with the mixer and add in 1/4 cup olive oil. Launch the P1 simmer program for 3 minutes. 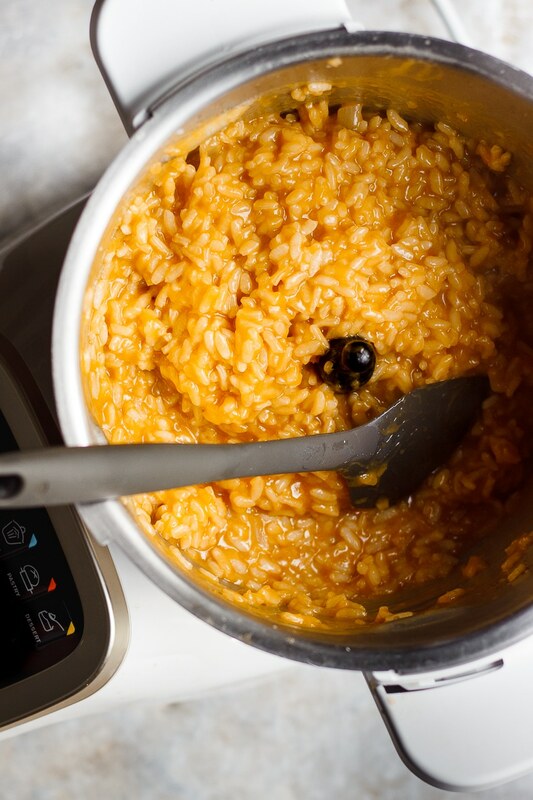 Add in the rice and relaunch the P1 simmer program at 270°F for 4 minutes. After 3 minutes, add in the white wine and continue to cook for the remaining 1 minute. Then add in the broth and launch the P2 simmer program at 200°F for 20 minutes, without the stopper. Meanwhile heat the remaining 1/4 cup olive oil in a sauté pan over low-medium heat. Cook the carrots for 3 minutes while occasionally stirring. Turn the heat up to medium and add in the parsley and the remaining white wine. Stir and cook for two minutes more. Remove from the heat and season with salt and pepper and set aside. After the risotto has completed cooking add in salt and pepper to taste, and the cheese if you are using. Serve immediately with the herbed caramelized carrots, and more cheese if you desired. Finely mince the onion and heat it over low heat in a large sauté pan with the 1/4 cup olive oil for 3 minutes. Toss in the rice, stir and cook for 2 minutes more. Then add in the white wine and cook for 2 minutes. Add the 1 cup + 2 more cups vegetable broth to the rice, stir and bring to a boil Reduce the heat to low, cover and cook for 10 minutes. Remove the lid and stir once more. Replace the lid and continue cooking until the rice is al dente, about 10 more minutes. Remove from the heat and season with salt and pepper and set aside. This post is sponsored by All-Clad; all opinions are my own. I am the exact same way. I love having clean neat walls/floors/surfaces everything so I can’t deal with having too many things in my cabinets. I’ve been eyeing this All-Clad Prep & Cook. I’ve seen it a few times and everything that comes out of it is amazing! Also, please can we make risotto the official fall dish? It is perfection. I love risotto and was a favorite to make when my children were growing up! Ok, I have been looking at this appliance! It sounds so good! This looks magical. I have been thinking about what to make for dinner all day, and I was feeling so uninspired. I have all the ingredients on hand to make this, so that’s what I’m gonna do tonight! Can’t wait to try it out.